The CORE DE FORCE Eating Plan makes planning — and eating! 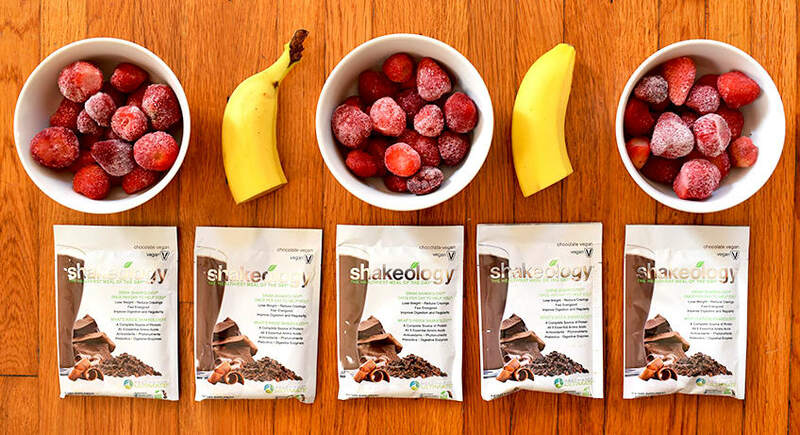 — healthy meals straightforward and delicious, so you can begin to see results faster. Don’t have CORE DE FORCE? Get it here! When you’re trying to get in knock-out shape, you need to fuel those hard-hitting workouts with the right foods in the proper portions. But figuring out what to eat to get killer results shouldn’t have to be a battle. First, if you haven’t already, use the simple calculation on page 1 of the CORE DE FORCE Eating Plan to figure out your Calorie Target and the corresponding Food Plan that is right for you. 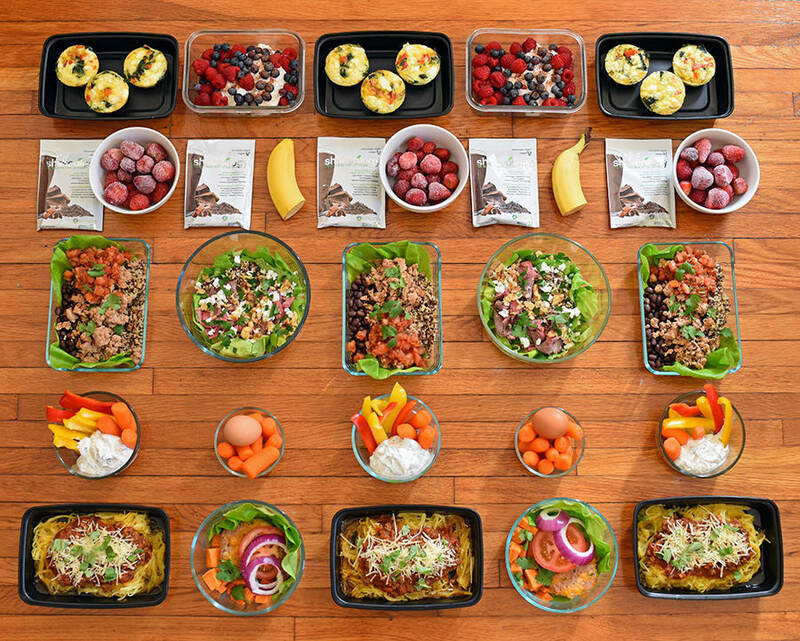 This meal prep menu follows Plan A, the 1,200–1,500 calorie level. If you are eating at a higher calorie level, you get to eat even more healthy food! Simply add additional foods. What’s Included in the CORE DE FORCE Meal Plan? M/W/F: Sautéed Kale and Red Bell Pepper Egg Cups made with 2 eggs, a mixture of ¼ onion, ½ cup chopped kale, ½ red bell pepper sautéed in 1 tsp. olive oil, and 2 Tbsp. crumbled feta (1 red, 1 green ½ blue, 1 tsp.) During CORE DE FORCE week two and three add fruit (1 purple). T/Th: Spinach and Roast Beef Salad made with 1 cup baby spinach, 2 oz. sliced roast beef, ½ cup quinoa, 1 Tbsp. feta, 1 Tbsp. chopped walnuts, 2 Tbsp. balsamic vinaigrette (1 green, ½ red, 1 yellow, ½ blue, 1 orange) During CORE DE FORCE week two and three add apple slices soaked in lemon juice (1 purple). T/Th: Jalapeño and Cheese Turkey Burgers (based on the Jalapeño and Cheese Burgers on page 40 of the CORE DE FORCE Eating Plan) made with 4 oz. ground turkey, ½ jalapeño, 2 Tbsp. shredded cheddar, 1 leaf butter lettuce, 1 slice tomato, and 1 slice red onion, served with ½ cup baked sweet potato bites cooked with 1 tsp. olive oil (1 red, 1 green, 1 yellow ½ blue, 1 tsp.) During CORE DE FORCE week three add ¼ avocado (1 blue). Heat oven to 400° F. Carefully cut the spaghetti squash in half and scrape out and discard the seeds. 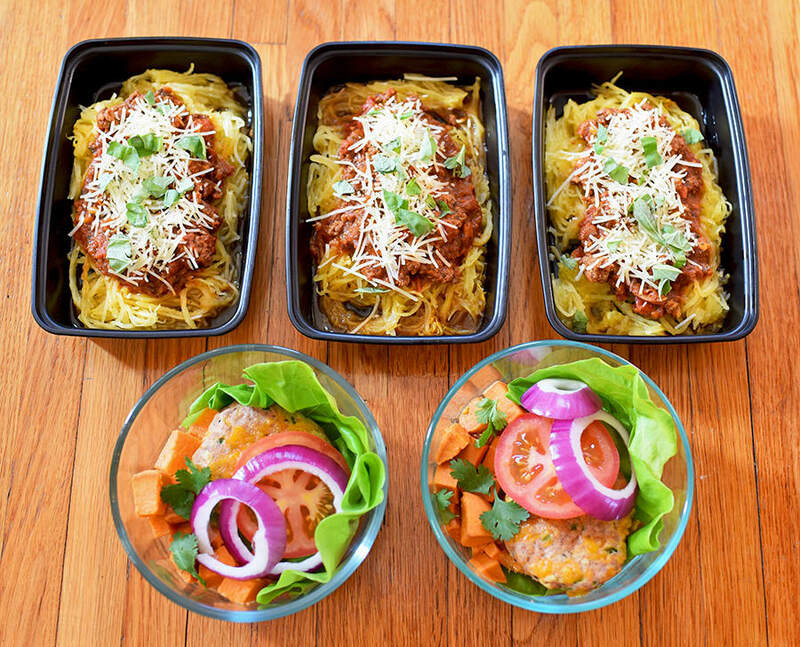 Arrange the spaghetti squash face down in a glass baking dish. Fill the dish with just enough water to cover the bottom. Place in oven for 30-45 minutes, or until squash is tender and the skin can be easily pierced with a fork. Remove from oven and set aside to cool. Peel the sweet potato and chop it into 1-inch cubes. Arrange on a baking sheet and drizzle with 2 tsp. olive oil. Place on another rack of the oven and cook until tender, about 20 minutes, stirring once. Remove from oven and set aide to cool. Cook the quinoa. cook the quinoa. Bring 2 cups of water to a boil. Rinse and drain 1 cup quinoa, then add it to the boiling water. Reduce heat to low and simmer, covered, for 15 minutes or until the quinoa is tender. When done, remove lid and set aside to cool. Quinoa can also be prepared in a rice cooker. Next, boil eggs for snacks. Place two eggs in large saucepan and add water to cover eggs by one inch. Bring water just to a boil over high heat. Remove from heat, cover, and let stand for 12 minutes. Remove from hot water and serve warm or rinse in cold water until cool. Place in refrigerator. 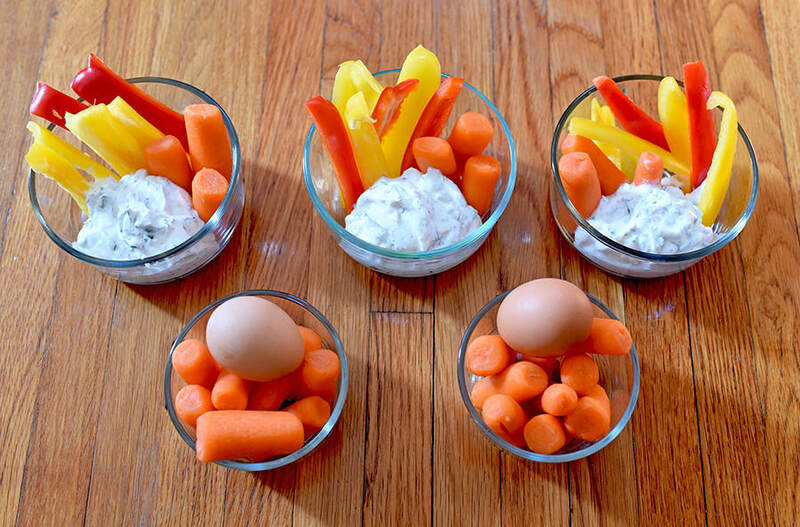 Serve each egg with 1 cup baby carrots. Make the Jalapeño and Cheese Turkey Burgers. Lower the oven temperature to 350° F (after the spaghetti squash and sweet potatoes are done cooking!). Place 8 oz. ground turkey (reserve the rest for the burrito bowls), 1 finely chopped jalapeño, ¼ cup shredded cheddar cheese, and salt and pepper in a medium bowl. Combine well using a mixing spoon (because of the jalapeño,we don’t recommend mixing with your hands). Divide the mixture into two equal portions, then shape these into patties. Make a slight depression in the top of each patty. Place patties in a glass baking dish and place in the oven for 20 minutes. Remove from the oven and set aside to cool. Leave oven on. When cool, place the burgers into two food storage containers; add one lettuce leaf, one thick slice of tomato, one slice of red onion, and ½ cup sweet potatoes. Place in refrigerator. Chop all vegetables for the Sautéed Kale and Red Bell Pepper Egg Cups (¾ onion, 1½ cup kale, 1½ red bell peppers). Add 1 Tbsp. olive oil to a pan over medium heat. Add all veggies to the pan and stir, cooking until onion is translucent, about 5 minutes. Season with salt and pepper. Crack six eggs into a bowl and whisk. Coat a large muffin tin with nonstick spray. Fill nine of the muffin cups with vegetables. Use a large spoon to cover the vegetables with eggs, adding a little bit at a time, until each cup is almost full. Top each with 1 Tbsp. crumbled feta. Place in the oven and cook for about 15 to 20 minutes, until eggs are just set. Remove from oven and allow to cool; when cool, gently remove the egg muffins from the pan. 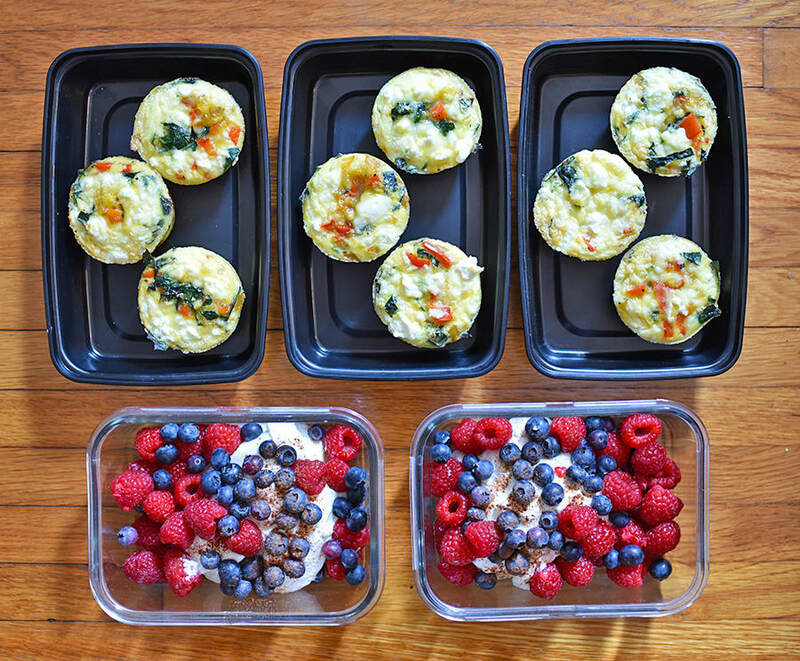 Divide the egg muffins between three food containers, and place in the fridge. To reheat, microwave for 1 to 2 minutes or warm in a toaster over for 5 minutes. If you are in week two or three of your CORE DE FORCE fitness program, serve this meal with 1 cup fresh berries or other fruit. 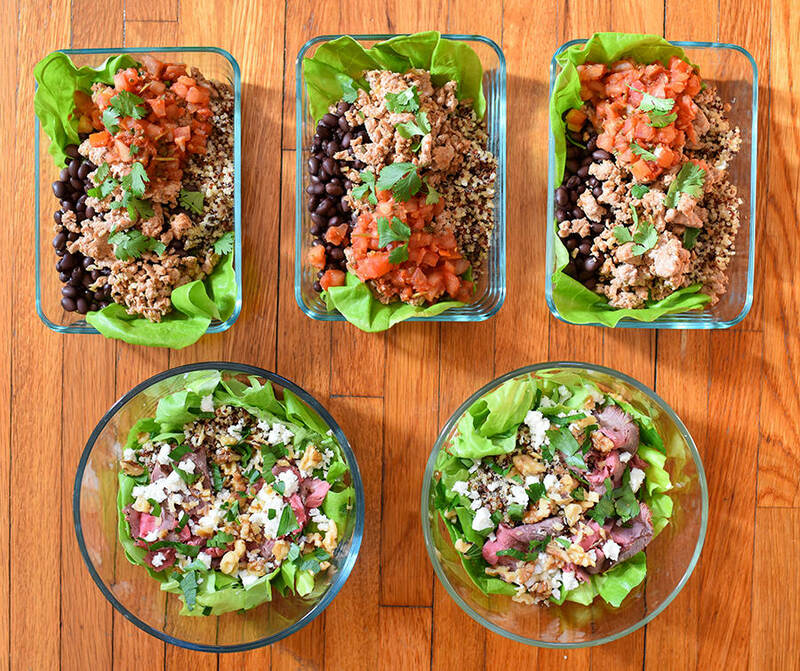 Next, make the Seasoned Turkey and Black Bean Burrito Bowls. Add 1 Tbsp. olive oil to a pan over medium heat, place 12 oz. ground turkey in the pan, and stir frequently until no longer pink, about 5 minutes. Season with salt and pepper, 1 tsp. ground cumin and 1 tsp. chili powder (or salt-free taco seasoning mix). Remove from heat and set aside to cool. Divide turkey mixture evenly between three food containers. Add ½ cup black beans (drained and rinsed), ½ cup quinoa, ½ cup salsa, and top with 1 Tbsp. cilantro. Place in refrigerator. If you are in week two or three of your CORE DE FORCE fitness program, serve with ¼ avocado. Now, it’s time to make the Spaghetti Squash with Meat Sauce and Parmesan Cheese. Set out three food storage containers. Use a fork to scrape the spaghetti squash out of its skin. Add 1 cup of squash to each container. Freeze any remaining squash for a future week. Wash the pan used for the Seasoned Turkey meat and place it over medium heat; coat it with nonstick spray. Add 6 oz. ground beef and three cloves of chopped garlic to the pan and season with salt and pepper; stir frequently until the meat is no longer pink. Add 1½ cup tomato sauce and 1 tsp. dried oregano (or salt-free Italian seasoning), and cook two minutes more. Top each serving of spaghetti squash with equal amounts of sauce (about ¾ cup), 2 Tbsp. shredded Parmesan, and 1 tsp. fresh basil. Place in refrigerator. When ready to eat, heat in a microwave or in a pan on the stovetop for two minutes. Now, build the Greek Yogurt Bowls. Set out two food storage containers. To each, add ¾ cup yogurt, 1 cup mixed fresh berries, and ¼ tsp. cinnamon. Cover and place in fridge. Make the Herbed Yogurt Dip. In a small bowl mix 9 oz. (a little more than 1 cup) of yogurt, 2 tsp. dried oregano (or salt-free Italian seasoning), 1 Tbsp. chopped fresh basil, and any other dried spices you want, like ½ tsp. dried thyme or dill, garlic powder, onion powder, a dash of paprika. Add salt and pepper to taste. Chop the remaining ½ red bell pepper and one yellow bell pepper. Serve 3 oz. of dip with one cup of chopped bell peppers and baby carrots. You’re almost done! Last, build the Spinach and Roast Beef Salads. Prepare two large food storage containers. To each, add 1 cup baby spinach, 2 oz. sliced roast beef, ½ cup quinoa, 1 Tbsp. feta, and 1 Tbsp. chopped walnuts. If you are in week two or three of your CORE DE FORCE fitness program, add 1 cup apple slices soaked in lemon juice to each salad. Cover, and place in fridge. Serve with 2 Tbsp. balsamic vinaigrette.